1/35 Sherman M4A3E8 "Thunderbolt VII"
Dragon has invested considerable efforts in research and development of its brand new M4A3E8 Sherman, so much so that this can be considered as the ultimate 1/35 model kit of this variant ever to hit shop shelves! Nothing has been spared in this kit, with completely new parts for the hull, workable suspension assemblies with optional springs, new tracks, and a whole ream of other modifications. There is even an optional set of parts to represent the armor plates that were sometimes welded on for increased protection! 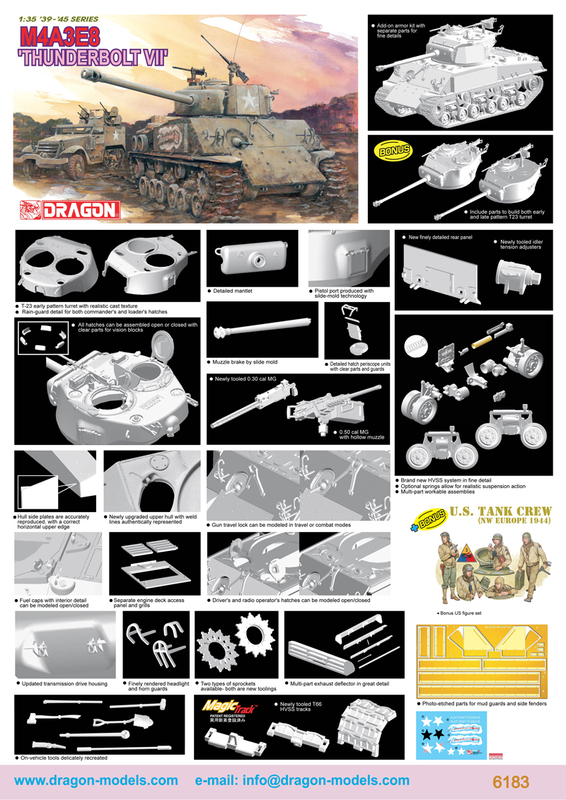 This is a complete package, supplying everything that Sherman modelers could ever dream of needing, whether it be in plastic, metal, photo-etched metal, or clear plastic. And for a tank version called the “Easy Eight”, Dragon’s vast manufacturing experience means that this complex kit remains “easy” and fun to build! The Sherman was the mainstay of the Allied armored units, with over 40,000 produced from 1942 onwards. The ubiquitous Sherman was to be found in the ranks of every Allied army in World War II and on every front.